The original design of Haley Tricycles, and the base of our current models. They were designed for replacing, not minimizing, the use of a car (a yellow 1974 Super Beetle with a luggage rack), and we assume our customers will be using their trikes for all kinds of real life adventures, from daily errands to running businesses completely with pedals, in sunshine, rain, ice and snow. All of our trikes have hinged or removable lids, so your cargo stays dry if you're caught in a storm, nasty puddles won't get your stuff dirty, and small things won't be lost. Also, people on the street can't see what you're moving, so you can have anything inside the box without extra attention to your dirty laundry, figuratively or literally. The boxes are lockable for multiple stops around the city, and when you need to leave your equipment unattended on the sidewalk before unloading. Haleys can carry 260 pounds of cargo (460 pounds including the rider), in real world conditions. We also offer heavy use frames, geometry and components, capable of 460 pounds of cargo (660 pounds total), if you need something even stronger. We build the box to fit your stuff, anywhere between 31-50" long and 14.5-26" tall. The interior width is almost always 21.5" wide. 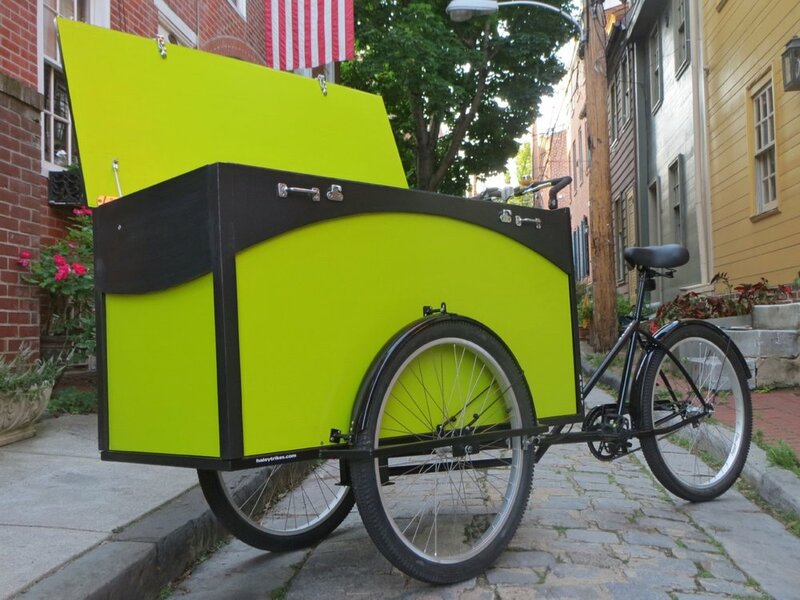 The standard width keeps the trike narrow enough to ride through 36" doorways, and through even Philadelphia's narrow, traffic clogged streets.